Various aspects of warped conformal field theories (WCFTs) are studied including entanglement entropy on excited states, the Rényi entropy after a local quench, and out-of-time-order four-point functions. Assuming a large central charge and dominance of the vacuum block in the conformal block expansion, (i) we calculate the single-interval entanglement entropy on an excited state, matching previous finite temperature results by changing the ensemble; and (ii) we show that WCFTs are maximally chaotic, a result that is compatible with the existence of black holes in the holographic duals. Finally, we relax the aforementioned assumptions and study the time evolution of the Rényi entropy after a local quench. We find that the change in the Rényi entropy is topological, vanishing at early and late times, and nonvanishing in between only for charged states in spectrally-flowed WCFTs. D.M. Hofman and A. Strominger, Chiral scale and conformal invariance in 2D quantum field theory, Phys. Rev. Lett. 107 (2011) 161601 [arXiv:1107.2917] [INSPIRE]. S. Detournay, T. Hartman and D.M. Hofman, Warped conformal field theory, Phys. Rev. D 86 (2012) 124018 [arXiv:1210.0539] [INSPIRE]. D.M. Hofman and B. Rollier, Warped conformal field theory as lower spin gravity, Nucl. Phys. B 897 (2015) 1 [arXiv:1411.0672] [INSPIRE]. R.A. Davison, W. Fu, A. Georges, Y. Gu, K. Jensen and S. Sachdev, Thermoelectric transport in disordered metals without quasiparticles: the Sachdev-Ye-Kitaev models and holography, Phys. Rev. B 95 (2017) 155131 [arXiv:1612.00849] [INSPIRE]. D. Anninos, W. Li, M. Padi, W. Song and A. Strominger, Warped AdS 3 black holes, JHEP 03 (2009) 130 [arXiv:0807.3040] [INSPIRE]. G. Compere and S. Detournay, Semi-classical central charge in topologically massive gravity, Class. Quant. Grav. 26 (2009) 012001 [Erratum ibid. 26 (2009) 139801] [arXiv:0808.1911] [INSPIRE]. J.M. Bardeen and G.T. Horowitz, The extreme Kerr throat geometry: a vacuum analog of AdS 2 × S 2, Phys. Rev. D 60 (1999) 104030 [hep-th/9905099] [INSPIRE]. G. Compère and S. Detournay, Boundary conditions for spacelike and timelike warped AdS 3 spaces in topologically massive gravity, JHEP 08 (2009) 092 [arXiv:0906.1243] [INSPIRE]. G. Compère, W. Song and A. Strominger, New boundary conditions for AdS 3, JHEP 05 (2013) 152 [arXiv:1303.2662] [INSPIRE]. T. Azeyanagi, S. Detournay and M. Riegler, Warped black holes in lower-spin gravity, Phys. Rev. D 99 (2019) 026013 [arXiv:1801.07263] [INSPIRE]. C.T. 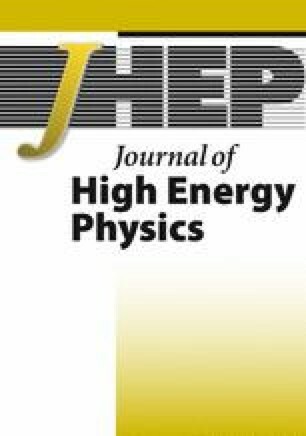 Asplund, A. Bernamonti, F. Galli and T. Hartman, Holographic entanglement entropy from 2d CFT: heavy states and local quenches, JHEP 02 (2015) 171 [arXiv:1410.1392] [INSPIRE]. S. He, T. Numasawa, T. Takayanagi and K. Watanabe, Quantum dimension as entanglement entropy in two dimensional conformal field theories, Phys. Rev. D 90 (2014) 041701 [arXiv:1403.0702] [INSPIRE]. W.-Z. Guo and S. He, Rényi entropy of locally excited states with thermal and boundary effect in 2D CFTs, JHEP 04 (2015) 099 [arXiv:1501.00757] [INSPIRE]. B. Chen, W.-Z. Guo, S. He and J.-Q. Wu, Entanglement entropy for descendent local operators in 2D CFTs, JHEP 10 (2015) 173 [arXiv:1507.01157] [INSPIRE]. W.-Z. Guo, S. He and Z.-X. Luo, Entanglement entropy in (1 + 1)D CFTs with multiple local excitations, JHEP 05 (2018) 154 [arXiv:1802.08815] [INSPIRE]. C.T. Asplund, A. Bernamonti, F. Galli and T. Hartman, Entanglement scrambling in 2d conformal field theory, JHEP 09 (2015) 110 [arXiv:1506.03772] [INSPIRE]. S. He, Conformal bootstrap to Rényi entropy in 2D Liouville and super-Liouville CFTs, Phys. Rev. D 99 (2019) 026005 [arXiv:1711.00624] [INSPIRE]. Y. Kusuki and T. Takayanagi, Rényi entropy for local quenches in 2D CFT from numerical conformal blocks, JHEP 01 (2018) 115 [arXiv:1711.09913] [INSPIRE]. Y. Kusuki, Light cone bootstrap in general 2D CFTs and entanglement from light cone singularity, JHEP 01 (2019) 025 [arXiv:1810.01335] [INSPIRE]. J.M. Maldacena and H. Ooguri, Strings in AdS 3 and SL(2, R) WZW model 1: the spectrum, J. Math. Phys. 42 (2001) 2929 [hep-th/0001053] [INSPIRE]. P. Calabrese and J.L. Cardy, Entanglement entropy and quantum field theory, J. Stat. Mech. 0406 (2004) P06002 [hep-th/0405152] [INSPIRE]. P. Calabrese and J. Cardy, Entanglement entropy and conformal field theory, J. Phys. A 42 (2009) 504005 [arXiv:0905.4013] [INSPIRE]. M. Rangamani and T. Takayanagi, Holographic entanglement entropy, Lect. Notes Phys. 931 (2017) pp.1 [arXiv:1609.01287] [INSPIRE]. A.A. Belavin, A.M. Polyakov and A.B. Zamolodchikov, Infinite conformal symmetry in two-dimensional quantum field theory, Nucl. Phys. B 241 (1984) 333 [INSPIRE]. P. Caputa, M. Nozaki and T. Takayanagi, Entanglement of local operators in large-N conformal field theories, PTEP 2014 (2014) 093B06 [arXiv:1405.5946] [INSPIRE]. T. Hartman, C.A. Keller and B. Stoica, Universal spectrum of 2d conformal field theory in the large c limit, JHEP 09 (2014) 118 [arXiv:1405.5137] [INSPIRE]. T. Hartman and A. Strominger, Central charge for AdS 2 quantum gravity, JHEP 04 (2009) 026 [arXiv:0803.3621] [INSPIRE]. A. Castro, D. Grumiller, F. Larsen and R. McNees, Holographic description of AdS 2 black holes, JHEP 11 (2008) 052 [arXiv:0809.4264] [INSPIRE]. A. Castro and W. Song, Comments on AdS 2 gravity, arXiv:1411.1948 [INSPIRE]. M. Cvetič and I. Papadimitriou, AdS 2 holographic dictionary, JHEP 12 (2016) 008 [Erratum ibid. 01 (2017) 120] [arXiv:1608.07018] [INSPIRE]. A. Castro and F. Larsen, Near extremal Kerr entropy from AdS 2 quantum gravity, JHEP 12 (2009) 037 [arXiv:0908.1121] [INSPIRE]. Y. Matsuo, T. Tsukioka and C.-M. Yoo, Another realization of Kerr/CFT correspondence, Nucl. Phys. B 825 (2010) 231 [arXiv:0907.0303] [INSPIRE]. P. Caputa, Y. Kusuki, T. Takayanagi and K. Watanabe, Out-of-time-ordered correlators in (T 2)n /Z n, Phys. Rev. D 96 (2017) 046020 [arXiv:1703.09939] [INSPIRE]. S.H. Shenker and D. Stanford, Multiple shocks, JHEP 12 (2014) 046 [arXiv:1312.3296] [INSPIRE]. S. Leichenauer, Disrupting entanglement of black holes, Phys. Rev. D 90 (2014) 046009 [arXiv:1405.7365] [INSPIRE]. A. Maloney, W. Song and A. Strominger, Chiral gravity, log gravity and extremal CFT, Phys. Rev. D 81 (2010) 064007 [arXiv:0903.4573] [INSPIRE]. Y. Sekino and L. Susskind, Fast scramblers, JHEP 10 (2008) 065 [arXiv:0808.2096] [INSPIRE]. D.A. Roberts, D. Stanford and L. Susskind, Localized shocks, JHEP 03 (2015) 051 [arXiv:1409.8180] [INSPIRE].